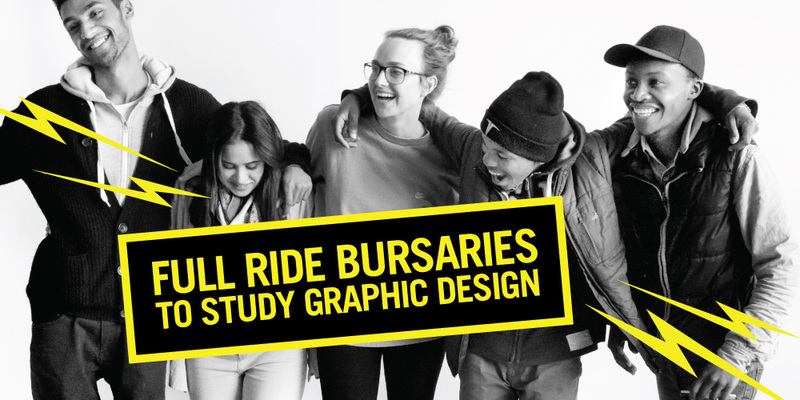 On my previous blog posts, Where to study graphic design in South Africa and Study Graphic Design: Universities vs Independent Design Schools, I have had several queries regarding admission requirements for the Graphic Design Programme. If you want an accredited National Diploma in Graphic Design or a BA Design Degree you need to make sure that you have a National Senior Certificate (NSC) as certified by Umalusi (or equivalent). But what does this mean? Below are some guidelines for you to follow, but please note that different institutions may have specific levels of subject achievement, ie they may only require a 2 for Mathematics on the APS scale of achievement or a 4 for Mathematical Literacy. Some may even have Visual Arts as a compulsory subject. Note also that Life Orientation only has a credit value of 10 and may be divided by 2 in the calculation of the final APS rating. 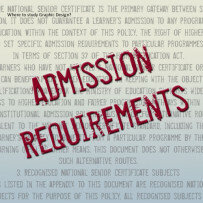 The minimum admission requirement is a National Senior Certificate with an endorsement of a bachelor’s degree or a diploma, or an equivalent qualification, with an achievement level of at least 4 for English (home language or first additional language). You will also need to submit a prescribed portfolio. The Life Orientation score is divided by 2 when calculating the total APS. The minimum admission requirement is a National Senior Certificate (NSC) with an endorsement of a bachelor’s degree, as well as an APS of 30. The Life Orientation score is divided by 2 when calculating the total APS. The list already includes three of the four compulsory subjects for obtaining the NSC, namely, Languages, Maths or Maths Literacy. A learner must then select one or more subjects from the list below, provided that they are not from the same group in order to apply for a degree programme. Hi there Erica. I’m another, young, starry-eyed designer wanna-be! I love deign and am seriously considering studying graphic design after school (I’m in grade 11). You mentioned earlier that this field is extremely competitive so I fear that the ‘need’ for a gd is being excessively met. I sometimes question myself about whether I’ve got what it takes. What skills, in your opinion, make for a successful graphic designer? I’d very much appreciate any other tips and advice you have me and other aspiring designers. Hi Thokozani, thanks for your comment. I am no student advisor, but I can recommend you study what you are passionate about. I always loved art and design at school and that’s why I studied graphic design. Today I can truly say I love my job! Best of luck! I’m currently doing maths literacy,economics, tourism,history but not visual art I want to know that can I get into varsity and do music and graphics?? Which is the best institution in South Africa to study graphic design and can you get a stable job? How competitive is it and would you recommend doing a bachelor’s degree or a national diploma? How long can you stay in the field? Where can you get an internship? 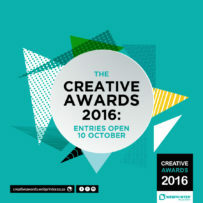 Hi Bongiwe, for a list of schools which offer graphic design please see my post Where to study graphic design in South Africa. Graphic design is very competitive so a Bachelor’s degree would be advisable. I don’t do visual art but I take EGD and I’m not really good in drawing. Do you recommend doing a graphics course? I’m in matric and I LOVE the idea graphic design please help. Hi Raymond, you don’t have to be good at drawing to be a graphic designer, but you have to be creative! I am Home Schooled and do not have a Matric but would love to study Graphic design,, is there a possibility I will still be able to go on a course without a matric certificate . I would like to study animation design. 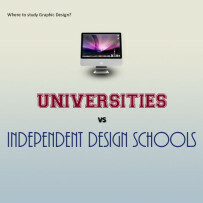 is it the same as graphic designing and where can i study it in South Africa? My subjects are Math Literacy, Visual Arts, Life Sciences, Computer Applications Technology, Two Languages and LO. Hi Lunga, there are many aspects of graphic design but Animation Design falls more under Interaction Design and Multimedia Design. These focus more on digital media, ie 3D animation, Game Design, Web Design, Video and Sound Editing. Some courses I listed in my post Where to study graphic design in South Africa do include Multimedia Design in their program, but I would recommend rather doing a degree in Multimedia. Hi Nteboheleng, for a list of schools offering Graphic Design courses, please see my post Where to study graphic design in South Africa. I am a young man who loves drawing and thinking of studying graphic design however i lack information on which institutions offers it and do we have bursaries for graphic design. I have passed my matric however i fail maths, so will that stop me from being accepted/admitted in an institution.In other words am asking if I do qualify to study graphic design even if i failed maths? 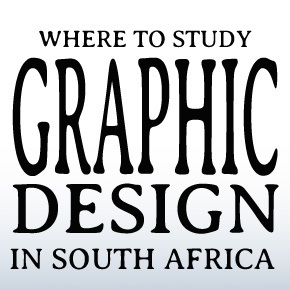 Hi Phistos, for a list of schools which offer graphic design please see my post Where to study graphic design in South Africa. 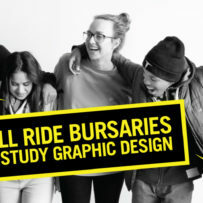 To study graphic design you need a National Senior Certificate (NSC) with a minimum of 30% in the language of teaching, coupled with an achievement rating of 3 (Moderate Achievement, 40-49%) or better in four recognised NSC 20-credit subjects. Hi Erica, Im so happy that I came across this site and I hope you still have time to reply to few more comments. Please help me. Im currently permanently employed but Im struggling to find a school that offers Graphic Design Part time. Can you please point me in the right direction. Hi Gladwin, sorry I am only replying now. The only part time courses in graphic design I know of are Oakfields College and Friends of Design. I am currently in grade 11. The subjects currently offered at my school. English, Afrikaans, Maths, Accounting, Business Studies, Economics, Technology and Cat. I want to be a graphic designer and would like some input on my career choice. Hi Clayton, I would recommend any subjects which will help develop your creativity, although they are not a requirement to study Graphic Design. 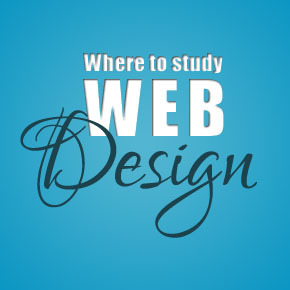 For details about graphic design, see my post Aspects of Graphic Design. I trust this email finds you well. My son has matriculated and is passionate about studying Engineering Graphic Design. The subjects he has completed in matric are English, Afrikaans, Maths Lit, Visual Arts, EGD and Civil Tech. Please advise what course he should take and where in Durban these courses are offered. Your help is greatly appreciated. Hi Ashnee, in Durban you can try Durban University of Technology, Inscape Design College or Vega. Hi Chantell, if you have a passion for design and being creative, then you should look at studying Graphic Design. 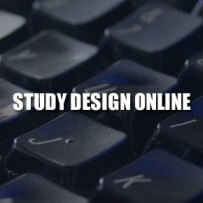 If you’re good at computer studies, then you can look at Multimedia Design. Best of luck! Hi Aakifah, both are accepted at most schools. Hi. I’m in grade 11 and have decided to do graphic designing. I take English, Core Math, Zulu, French and Information Technology. Will i be able to study graphic design? Hi, my name is Andiswa I am in grade 12 and I want to do graphic design, can I do it with these subjects Acc, Business, Economics, ENGHL, AFAL, Maths and LO? hi erica, i am 31 years old and dont have gr12. i am full time employed and wants to start my career in graphic design, thing is, like u said to become a graphic designer one should need a diploma or degree. fair enough.. but in my situation, no gr12 and full time employment, is there any place to study part time to achieve the diploma? or should i get gr12 first before i can apply to study for a diploma in graphic design? I would like to do graphic design but I am doing maths lit,g eaography,life sciences and tourism will I be able to qualify? Hi I’m Nikita and I’m in grade 9 I’m not sure if egd and physics is needed to become a graphic designer so what subjects do u need to become a graphic designer? Hi Nikita, there are no compulsory subjects required to study Graphic Design. 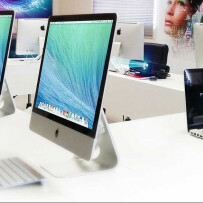 But recommended subjects include Art and Design, Business Economics and Computer Studies. Hi Evidence, yes you do need to be creative to be a graphic designer. All TUT applicants are required to submit a portfolio and based on the results of the portfolio assessment, successful applicants will be invited for an interview and language proficiency assessment. 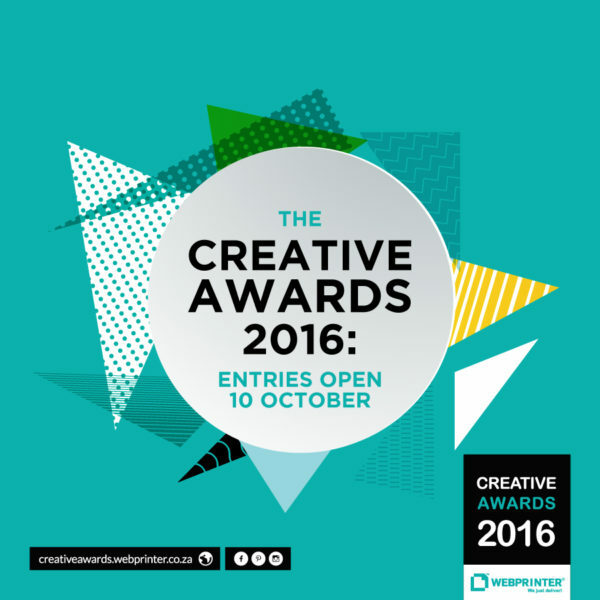 Detailed instructions and information regarding the portfolio will be provided once TUT has received your application. So should stop me from being a graphic designer? Hi Elegance, you might still qualify if you have enough Admission Points. 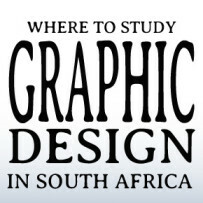 See my post Where to study graphic design in South Africa for a list of schools. Hi Erica I see that there is a 4 by Mathematical Literacy does that mean that I must Aquire 4 subjects higher than 50?? Hi Wonelisa, you don’t need to do art at school to study Graphic Design, but you do need to be artistic and creative. Hey Erica my name is Teddy and am in matric.Originally i want to be a footwear designer but there is no proper coarse for that and havent heard of in this country…so i choose to be a graphic designer so what are the requirements as a matriculant? Hi Jamain, it will depend if you want to study a Degree or Diploma. For a Diploma you can have any subjects, but for the Degree they need to be recognised NSC 20-credit subjects. I have added these designated subjects to my post. Hi my name is Ayanda, I studies Office Administration and I have a certificate that is equivalent to Matric with the following subjects, English, Mathematical Literacy, Life Orientation, Business Practice, New Venture Creation, Office Data Processing and Office Practice. Also did a Diploma in Management Assistant but I’m still waiting for my Diploma. I have wanted to study Graphic Design but the main problem I have is the portfolio that is required for me to have? 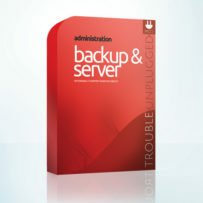 How do I go about trying to compile one? And I would like to know if some institutions do offer Bursaries ? Hi Ayanda, at most institutions they will send you full requirements for your portfolio once you have successfully registered. Examples of what might me required are still life drawing (like a chair), lettering (arranging letters within a grid), a comic strip and logo conceptualisation. Unfortunately I am not aware of any bursaries. Hi my name is Sibusiso and I’m looking forward to study graphic design in tertiary and I am a matriculant.My questions is that does universities require a portfolio even if I don’t know how to make it? Hi Sibusiso, Universities do require a portfolio, but most will send you full requirements once you have successfully registered. Hi my name is Daniel doing grade 12 and I’m pursuing a graphic designer career and I’m naturally talented in drawing thats the reason why I chose it,but I’m a very introverted person.So please I want to know if I will fit in this career but I love it.thank you! Hi Daniel, I am also very introverted but I love being a graphic designer. Best of luck! Can I be a graphic designer with a 24 aps.and how many subjects do I need to pass.